Archie Shine was a British furniture manufacturer which produced some high class Danish inspired designs in the late 50s and throughout the 60s. Archie Shine pioneered the Scandinavian style in Britain in the late 50s. The Scandinavian, and particularly the Danish look, was simple, elegant and with long, low lines. It was always high quality craftsman made and well proportioned. Teak, afromosia and rosewood were the favourite woods. The Danish look became classic middle class good taste in the late 50s, usurping more traditional looking furniture and the lighter looking modern furniture favoured at the time of the Festival of Britain in 1951. The Danish look became much more mainstream and popular in the 60s. Robert Heritage designed the famous Hamilton sideboard for Archie Shine. It was based on the classic Scandinavian, long, low lines. 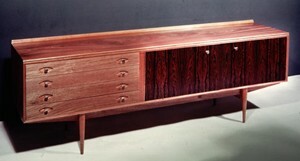 Robert Heritage won a Design Centre Award for this sideboard in 1958. Archie Shine continued with this style of sideboard into the 60s. Their sideboards are typically large, long and low, in the Scandinavian style. Robert Heritage's design career continued to develop in the 60s. He did lighting design for Rotaflex as well as working for Gordon Russell. Today the best place to find Archie Shine furniture is eBay. It was quality, expensive, furniture when it was new, but today it is still relatively well priced. Expect to pay £300 to £500 for an Archie Shine sideboard in good condition. Hamilton sideboards will be worth more, around the £1000 mark. Archie Shine dining room suites fetch £200 to £400. Although there are often bargains to be had on eBay. "I have a nest of Archie Shine teak coffee tables. Would you or do you know of anyone who would be interested in purchasing them. I also have a McIntosh teak table, with two butterfly action extensions, y chairs and matching sideboard. I would love a scan of the Archie Shine catalogue if possible. "Hi Barney, I'm researching Archie Shine furniture and came across this conversation and your note about the catalogue/leaflet you have from the show. I would be very pleased to receive a scanned copy of this and a photo of your sideboard also if possible. I hope this conversation is still open and very much look forward to hearing from you. "My late husband and I bought our Hamilton Dining Suite (sideboard, table and six chairs) in 1960. All the original markings are in place and I proud to say they are in immaculate used condition (much loved and cared for). I live in a village in NE Surrey where 3 other couples living here in the 1960s had the same suite. If it it not too late, I would very much appreciate a scan of the Hamilton leaflet. Would be most gratful for to receive scan copy of the 1962 catalogue. "If not too late I also would love a catalogue copy. I have several AS units. 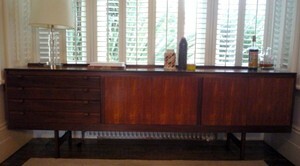 "I have an Archie Shine sideboard,with legs, " Dorrington" in Rosewood,good condition with original purchase invoice. My Mum is moving house and has a dining table which can seat up to 14 people with 2 leaves in it and a side board both of which she has said are Archie Shine from the 1950's I have photos of these items - is anybody interested in buying them as my Mum is down sizing and is gutted that she won't be able to fit them in her new home. "I currently have a Hamilton sideboard for auction on ebay. Very reluctant sale after many years use by my family, but does not fit in our new house. "I have an Archie Shine Granville Rosewood sideboard with a hinged flap which contains a large hot plate. The size is 7 ft by 1.8in wide. We bought it direct from the factory in the early 1970's and I still have the catalogue with all the various designs. I am thinking of selling this as I wish to redisgm our living room and am interested if anyone would like to buy it and give it a new home. "Please may I have a copy of the 1962 catalogue- I would be most grateful.